Sellsy's cash register is intended to be used with a barcode reader. This is the most efficient way to use the cash register if your products have barcodes. This method does not require any special setting. When you are logged into the interface, you can immediately start scanning products. What type of scanner should I choose? 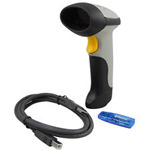 You can use any type of barcode reader with Sellsy. We offer two models, but you can also choose any model you'd like from other vendors. The bluetooth model is mandatory if you plan to use it with a tablet (iPad/Android) and can also be used with a computer (a bluetooth key is provided if your computer is not equipped). 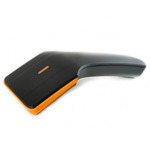 As bluetooth is wireless, this model gives you great freedom of movement. Our USB model is more economical model and is connected directly to your computer. Warning: this model will not work with tablets.